The Doctor has always admired the work of William Shakespeare. So he is a little surprised that Charley doesn’t hold the galaxy’s greatest playwright in the same esteem. In fact she’s never heard of him. General Mariah Learman, ruling Britain after the Eurowars, is one of Shakespeare’s greatest admirers, and is convinced her time machine will enable her to see the plays’ original performances. The Daleks just want to help. They want Learman to get her time machine working. They want Charley to appreciate the first ever performance of Julius Caesar. They believe that Shakespeare is the greatest playwright ever to have existed and venerate his memory. 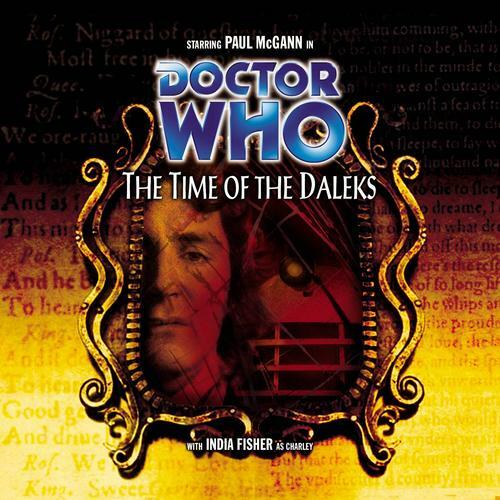 Paul McGann is the Doctor in…The Time of the Daleks. Shakespeare and Daleks. What could go wrong? There’s an unspoken rule with regards to Doctor Who – if the title of a serial contains the word “time,” there’s a very good chance that it’s not going to end well for the viewer. The Invasion of Time. Time-Flight. Timelash. Time and the Rani. Last of the Time Lords. The End of Time. The Time of Angels. The Time of the Daleks is the fourth serial in the loosely-connected Dalek Empire arc by Big Finish that sets the stage for the actual Dalek Empire series of releases a few month down the road, an audioseries where the Daleks declare war against the known universe and humanity struggles to survive. It’s also the first time the Eighth Doctor meets the Daleks (not counting his off-screen visit to Skaro to pick up the Master’s remains in the TV movie). With a script authored by the writer of several Eighth Doctor novels, The Time of the Daleks could have been another solid episode in the Eighth Doctor’s second season. But the story quickly abandons the “Daleks quoting Shakespeare” premise and gives us a story that’s repetitive and worst of all, dull. The Doctor loves Shakespeare. He gushes about him to Charley as they fly through the Time Vortex, spinning about the control room as he quotes the Bard’s greatest works. But Charley thinks he’s joking; while she’s heard of Christopher Marlowe and his works, William Shakespeare and his plays are a complete mystery to her. As the Doctor realizes she isn’t joking, the TARDIS hits a temporal speed bump. The Doctor realizes that this speed bump is actually a time fissure, stretching back to 1574 from early 21st century England. England at that time is under a benevolent military dictatorship under General Mariah Learman, hero of the EuroWars, who is currently trying to head off a major crisis on Albion’s green shores; a population that is rapidly forgetting the works of one of their national treasures! Once the TARDIS lands in Learman’s headquarters, the General is eager to show the Doctor one of England’s greatest secrets. Using a series of clocks and mirrors, it’s possible to open a window in time, allowing the past to be shown in a mirror’s reflection. General Learman is one of Shakespeare’s greatest admirers, and she plans on using the mirror to see the very first performance of Julius Caesar. And providing her with assistance in this project are several other fans of Shakespeare…a trio of Daleks! This is the third Big Finish script by Justin Richards, who previously penned the solid serial Whispers of Terror but stumbled a bit with the uniquely dull Red Dawn. Richards’ script is based around a unique concept. The Daleks, bred only for conquest, extermination, and subjugation, have no concept of art, music, or literature. So when they begin to praise the works of Shakespeare, quoting him verbatim, it takes the listener off guard. 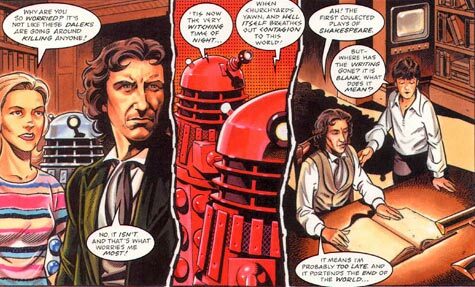 Throughout the entirety of the serial, the Daleks are sincere about their deal with General Learman that the works of Shakespeare will be preserved. It’s incredibly off-putting, up there with “we are your soldiers” and “would you like some tea?” If this concept had been carried out through all four episodes, this could have been one hell of a story. And with all those scenes, there’s too much going on and too many concepts being thrown about. It’s a common complaint I have about some of the Big Finish audios AND some of the older TV serials as well. A lack of need for a visual budget tempts writers to go for the big, epic story with lots of settings, running around, and concepts, but they rarely pay off. McGann’s Seasons of Fear is a great example of when it works, and on the flip side, Invaders from Mars is what you get when it doesn’t quite work. But Invaders was carried by solid and just a bit-over-the-top performances, which Time of the Daleks doesn’t have. In fact, the performances are very off-putting compared to the previous stories in the Eighth Doctor’s second season. One would expect Paul McGann’s Doctor to be in his element; the Victorian adventurer surrounded by mirrors and clocks, fending off an assault on knowledge from foes who do nothing but destroy. McGann delivers the Shakespeare well when called upon, but beyond that, he sounds incredibly bored with the entire thing, even when he’s supposed to be breathless and energetic. Coming off of his amazing performances in The Chimes of Midnight and Seasons of Fear, I wondered if McGann was perhaps beginning to become a bit bored with the role of the Doctor, though the next serial put that fear to rest. Really, McGann only shines when he’s interacting with Charley. India Fisher sounds like she’s in love with the whole thing. As opposed to the bemused Evelyn Smythe in The Apocalypse Element, Charley shows gallows humor through the serial; she’s horrified by the Daleks and scared out of her wits when running from them, but keeping a stiff upper lip when the situation looks dire. In particular, her performance in the very final scene of the serial is amazing, and sets the stage for the payoff of her character’s story arc in the next adventure. Sadly, the big reveal about WHY Charley is so important and why her presence is allowing for all of the events of The Time of the Daleks is handled with all the power of wet fireworks. Set up by the revelation of an entire fleet of Mark 90 TARDIS’s on the lookout for the Doctor, and explained with just a hint of technobabble, the reveal should hit home, and it does, but it should have had much more impact. The reveal that she was considered dead by the universe in the otherwise dismal Minuet from Hell had more emotional payoff, but that blame is on the writer, not Miss Pollard’s fine actress. Sadly, for a play with Shakespeare’s overtones, the supporting cast fails to really stand out. Even the Daleks, who were such a high point in the previous Dalek Empire serials, aren’t worth writing home about. The only one who shines among a cast including mad scientists, loyal security forces, and a kitchen boy whose role in the whole thing made me roll my eyes, is Dot Smith as General Learman. It could have been incredibly easy just to portray her as “Maggie Thatcher with a gun.” Instead, she shines as the leader who, while ambitious and hungry, comes off as “I’ll hand power back when everything is back to normal,” and a normal citizen almost believes her. And I will give credit for her ultimate motivation. Shakespeare is being erased from history because the normal citizens of England and the world don’t DESERVE Shakespeare. In return for assisting the Daleks, she asks only that SHE be the only one who remembers the complete works of Shakespeare, so only SHE can enjoy them. In the end, she does get what she wants, and her final fate is very well done, almost worthy of Shakespeare himself. And this brings me to my biggest complaint: blatant padding. The way the predestination paradox plays out is incredibly well done and laid out, especially considering how The Mutant Phase handled its own version. It’s clever, it’s logical, and the effects and consequences are felt throughout the serial before the paradox itself is revealed. However, while the paradox’s beginning/ending is played as the opening portion to The Time of the Daleks, when the paradox is replayed at the end of the serial, the whole thing is played again. Not highlights, not portions, not enough for the listener to pick out what happened to who, but the entire five-plus minute thing. It dragged on and on and on, a bit of “déjà vu” that was the final nail in the coffin of this story. But it’s all good, for in the epilogue, Charley’s final fate is set up, the surprise Big Bad for the season finale is revealed, and the listener is set up and baited for the amazing finale to the Doctor’s second season. It’s just too bad the tease comes at the end of a lackluster story. Final Synopsis – The Time of the Daleks drops its interesting premise by the second episode, leaving us with a rehash of previous Dalek stories performed by a troupe of disinterested players. 2/5. Next up – The Doctor holds the Time Lords’ only hope – but exactly what lengths will the Celestial Intervention Agency go to in their efforts to retrieve something important from within his TARDIS? What has caused Imperiatrix Romanadvoratrelundar to declare war on the rest of creation? And can an old nursery rhyme about a monster called Zagreus really be coming true? Paul McGann is the Doctor in Neverland. This entry was posted in Big Finish Review and tagged Big Finish, Charley Pollard, Daleks, Doctor Who, Eighth Doctor, paul mcgann, William Shakespeare. Bookmark the permalink. Excellent review, and I agree almost completely… except you gave it too many stars. *heh* This is probably my second-least-favorite McGann story (after “Zagreus”). There is one good story with “Time” in the title: “The Time Warrior.” Introduces Gallifrey by name, the Sontarans, and Sarah Jane Smith. And it’s just a fun story in general. Oh, “The Time Warrior” is one of my favorite stories as well. But it’s the standout in the “Time in the name” series. The others…well, they’re either bad serials or didn’t live up to their potential. Like this one. Man, here’s one where I would have loved to be in the editing room during the final scripting.